Announcing Holiday & Two Special Offers! But wait... there's more!! Now through November 21st, Krista of Krista Mason Photography (whose gorgeous photos are featured in the samples of our photo holiday cards this season!) is offering 1-hour portrait sessions in the Los Angeles area for $250 — and that includes digital files! Inspired by our Geometrica papergoods suite, Holimetrica brings some geometric good cheer (& a hidden image on the back!). Our refrigerator at home is covered in photo cards that we've received from family and friends. We don't live near family so it's wonderful to see these photos every day! It's around this time of year when our "fridge display" changes as we update it with new photo cards that we receive! With this in mind, we created 2 holiday card layouts that accommodate photos — Pino and Regalo. The Pino Holiday Card was inspired by memories of the holidays on the east coast. 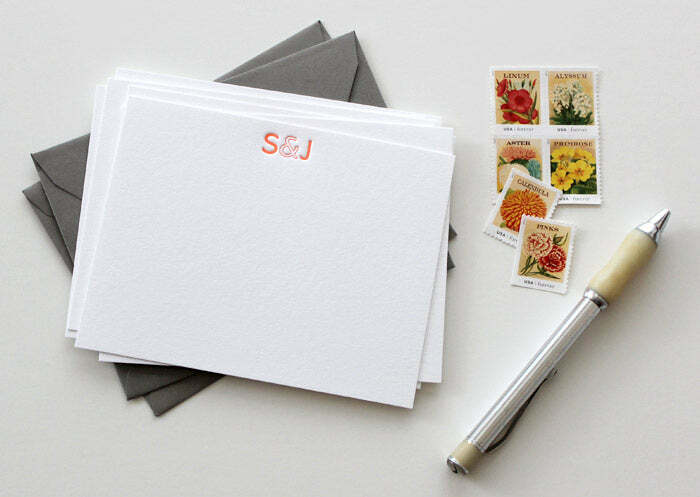 Add return address printing to save some time when addressing envelopes! Our second holiday photo card couldn't sum up our mantra for this season better — "Wrap up the season with joy and love"! We think Regalo does exactly that! Announcing Archetto, Classico, Geometrica & Petalo! You may have noticed that all has been pretty quiet on the blog front here at L&P. Not only are we in the midst of our most busy wedding season yet (yay! ), we've also been madly designing, photographing and prepping our online shop re-launch (double yay!)! A twist on the very popular chevron pattern, the Archetto papergoods suite features a bright color palette paired with very clean sans serif typography. This papergoods suite is very near and dear to our hearts since its inspiration is derived from our very own L&P logo! This clean, minimalist suite features the serif font and a red, white and soft grey palette. The couples version of this suite features a twist on the ampersand/heart from our logo! Our most popular suite to date, the Geometrica suite (inspired by our collab with Chandra of Oh Lovely Day!) is now expanded to include party decor and gift tags! The swoopy, swirly script pairs with a clean sans serif, hand drawn flower motif and mint green, buttercup and charcoal palette to create this modern yet sweet suite! Even the banner on the back has space for a personalized message too! And that's not all — we have big plans for the shop in the coming weeks! Shortly we'll be releasing designs for holiday which will include personalizable photo and non-photo holiday cards, gift wrap and gift tags. Shortly after that our 2015 calendar will be unveiled and ready for purchase too! It's popular for holiday hostess gifts, stocking stuffers and office gifts too! And then in the new year, we'll be releasing wedding suites and heaps more so stay tuned! When Chelsea from Lovely Indeed told me that she wanted us to design her business cards again this year, I was thrilled! Then… she said two magic words that made me jump for joy: “gold foil”! (Music to this graphic designer’s ears!!) 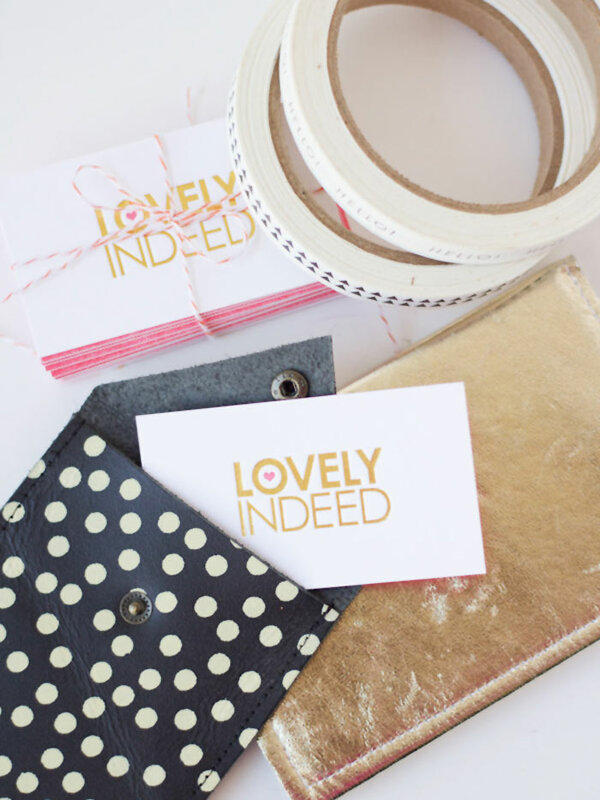 The resulting business cards feature her logo in gold foil with a letterpressed pink heart on one side and full bleed pink with her name and info reversed out on the other side. Check out Chelsea’s blog post where she talks a little bit about our process and a wacky idea that I had for the back of her biz cards! There’s also details on a special discount that I’m offering on custom designed business cards too! !